MINISTER of Sport Shamfa Cudjoe is seeking to set a precedent in which special-needs athletes are treated equitably in the distribution of state funds as a means of reward and incentive for medal winning performances on the global stage. Cudjoe welcomed the 44-member Special Olympics TT delegation back from the Special Olympics 2019 World Games in Abu Dhabi, United Arab Emirates, yesterday, following their record-breaking haul of 56 medals. The contingent of swimmers, weight lifters, bocce bowlers, equestrian riders and track and field athletes, 29 in all, picked up 19 gold, 15 silver and 22 bronze medals, competing against approximately 7,500 athletes from around the world. "I want to tell you that the celebrations are not over," Cudjoe said in her address. "Because the Ministry of Sport and Youth Affairs, along with the Office of the Prime Minister have had discussions with SOTT as to how we're going to host a reception to celebrate the achievements. "And, we have right now made a case to the Cabinet, which I'm sure will be approved to offer a small contribution and make the Special Olympics a path and/or policy for rewards and incentives for athletes. "We thank you for going out there and showing the world our good side," Cudjoe said in her address, in which she also strongly encouraged parents of children with learning disabilities to be proud and to afford them opportunities in sport to live their best possible life. 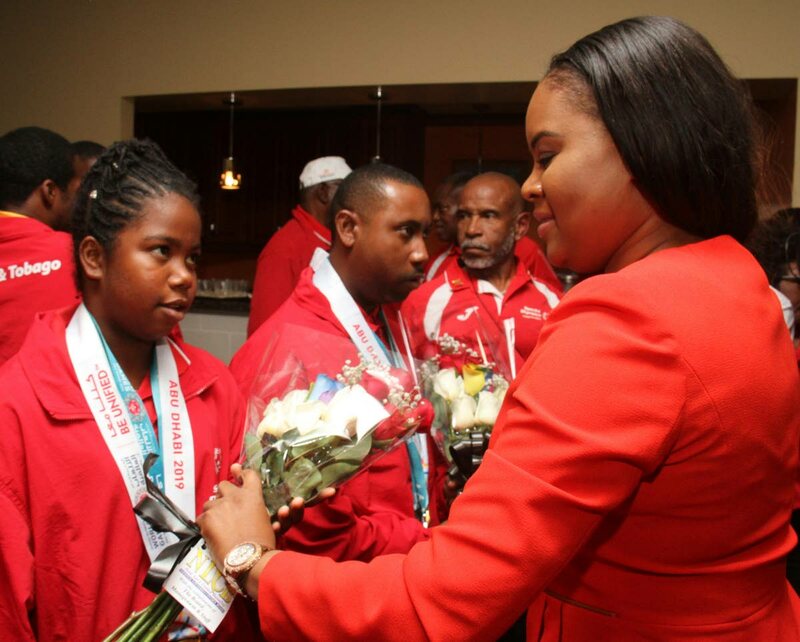 The athletes, donning their red track suits, walked proudly into a packed VIP Room at the Piarco International Airport upon touchdown from their stop in St Lucia. Downstairs, supporters and eager family members gathered in anticipation, cheering to the sound of tassa. There were roars of approval from the fans when the athletes finally made their way to the airport's exit. "(The delegation) went into the World Games with expectations," David Benjamin, vice-chairman Special Olympics and head delegate in the UAE, said earlier at the reception. "We were confident that, as Mr Bibby said, our stringent and in-depth training programme, which really seeked to enhance, as well as to build on the skills of all the persons in our programme, was working. Today is a true manifestation that that programme is definitely working." Their medal tally this year was an improvement from an already impressive 2015 World Games, where they earned 48 medals – 15 gold, nine silver and 24 bronze. "Today is another fantastic Friday," Special Olympics TT national director Ferdinand Bibby proclaimed to the returning athletes. Bibby said SOTT's technical committee found that although there were larger contingents of athletes from neighbouring Caribbean nations, none competed in as many events as SOTT. "In addition, our 75 per cent podium placing as it relates to events competed in, would not have been equalled by any of them. However, success does not come easy. It takes hard work (and) it takes support." Bibby said the support of sponsors, Digicel Foundation, NLCB and the Ministry of Sport, has been crucial to the organisation and its athletes' development, but extended a further invitation to potential corporate and individual partners to join in the journey of the 1,200 SOTT athletes and participants. "There is much more than we could do. At the other fantastic Friday, we were urged to pick up something, anything, and run with it. Today, we at SOTT ask that you join us, partner with us, and move on," Bibby said, adding that another journey began yesterday. SOTT's volunteers, coaches and athletes, he said have already shifted their focus to the 2021 World Winter Games in Sweden and the next World Games in Berlin two years later. Reply to "Cudjoe: ‘The celebrations are not over’"